LOS ANGELES, CA--(Marketwire - April 28, 2008) - You've undoubtedly been approached by an enthusiastically earnest, envelope-wielding co-worker or family member asking if "you want to go in with us on a gift?" You may waver, but ultimately, you realize that if you went ahead and purchased something on your own, it would never be as generous as a group gift. But even Group Gifting has its troubles, especially for the person collecting the money. There's invariably someone who'll give you an I.O.U. and payment can be in all different forms. Some gave you checks, others used Paypal, and still others hand you their share... in change. Then, there's the shopping (and invariably, the store which didn't have what you're committed to get), the buying, the carrying to and from your car, the wrapping, the delivery. Between the time and responsibility, being a Group Gift Organizer is the bailiwick of the young. Once you've done it, it's not bloody likely you'll make another offer to head the operation up again. 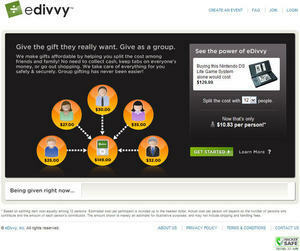 The future of Group Gifting is here and its name is eDivvy.com. Based in Los Angeles, eDivvy.com allows gift givers to not only contribute to a truly sensational gift, but is done in super simple steps. 1. Choose a gift from some of the most popular retailers in the country. 2. Enter the emails of people you want to invite. 3. Take a bow. You'll get all the credit with only the tiniest trace of "work." eDivvy automates the annoying portion of Group Gifting, like collecting money, sending reminders and acquiring the gifts. eDivvy does all of the coordinating. Just call eDivvy your P.A. (personal assistant). With eDivvy, every aspect can be tracked, the perfect gift selected, who to invite to contribute and the process of "divvying up" the cost. Gifters can monitor contributions and the entire process (consider how bill pay changed your life!). Coin collected, the gift is sent to the lucky recipient's destination, directly from the merchant. eDivvy reinvents group gifts. Efficient, easy, and affordable. And isn't that the way all things should work? eDivvy.com, launched in February 2008, began when cofounder Steven Ng, overwhelmed by the sheer number of birthdays and celebrations in his inner circle, sought a simple way to involve faraway friends and family in his gift-giving. To his dismay, he couldn't find a solution on the Internet, so he and his friends decided to build what they needed. The result is eDivvy, the better way to group gift. About this company eDivvy, Inc.
eDivvy, Give the Gift they really want. Give as a group.